Published in Rafu Shimpo, June 17, 1955. 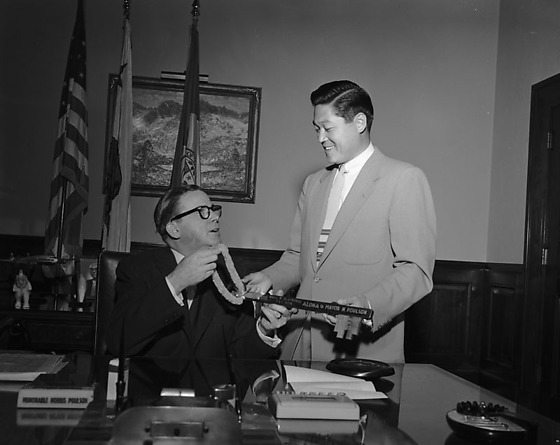 Deputy Attorney General Robert Fukuda of Hawaii presents a key to Honolulu, "Aloha to Mayor Poulson," on behalf of Honolulu Mayor Neal Shaw Blaisdell to Los Angeles Mayor Norris Poulson in his office in Los Angeles, California, June 14, 1955. Poulson, a Caucasian man in a dark suit and eyeglasses, sits behind his desk holding onto wooden key and a small lei around key as he looks up at a smiling Japanese American man, right, in a light colored suit and striped necktie. Lei is looped around head of key, "Neal S. Blaisdell, C&C;, Hon., Aloha to Mayor N. Poulson." Three flags on stands in background, American, Californian, and City of Los Angeles. Typed on original negative envelope: Aloha to Mayor Poulson.